With all the advances in technology, commerce has changed drastically over the years. Tablets are the latest in a long line of technological advances that include laptops and smartphones. With all these devices, more people are spending time on their couches or in recliners at home, browsing the Internet while they watch television. This gave birth to the term, “couch commerce..” Therefore, retailers who want to make the most of this latest trend need to tailor their e-commerce sites to the various screen sizes available on tablets and smartphones, as well as their touch capabilities. In 2012, the use of tablets for online shopping was put to the true test. This year, a boom is expected in the area of Mobile Commerce, greatly increasing the number of people who are making purchases with their mobile devices, particularly tablets, from the comforts of home. In fact, the latest research shows that mobile commerce, including couch commerce, is projected to grow by more than 30 percent over the next five years. These projections and trends indicate retailers need to place their focus on this new couch commerce to ensure their success. Mobile Optimization – Your website needs to be tailored to various screen sizes, as well as the touch features that make smartphones and tablets more appealing to users. Target a Local Audience – Mobile sites can now use location features and GPS to offer your customers with the ability to find a local store or to obtain special deals designed for local customers only. Draw Customer Attention – You need to think about what your customers want and need from you. When you tailor your mobile website to meet their needs in a way that is attractive to them, you increase your chances of success. Focus on the Tablet Market – The tablet market has grown by leaps and bounds. These are the devices more people are using to access online retailers and make the purchases they desire. While smartphones are still important, tablets are becoming more important every day. Create a Cross-Selling Experience – Couch commerce involves more than the use of a tablet. Because most people watch television while they browse, you need to tailor your experience to cross-sell with what your customers are likely seeing on television, making it a more interactive experience. 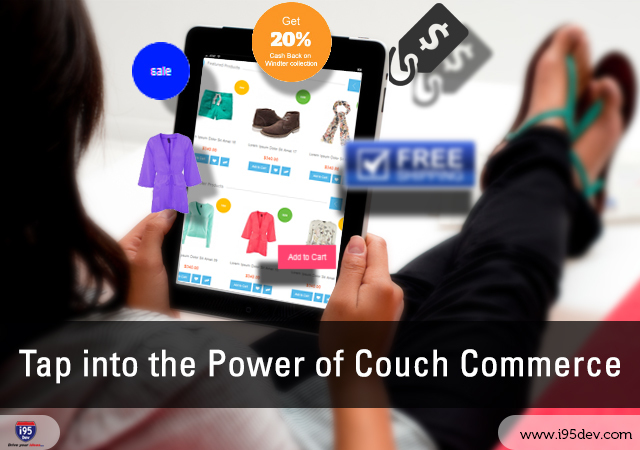 It is important for retailers to focus more on the tablet extension of couch commerce, however. Over the past months, tablet commerce has quickly grown to reach beyond smartphone commerce and is even healthy competition for desktop purchases. When you focus your mobile strategy on creating an enticing and engaging c experience for your customers via their tablet devices, you will be able to increase your sales and see a positive change in your retail store. The more creative your approach, the greater your success will be! There is no limit to what you can do when it comes to couch commerce. Contact i95Dev to learn more about the importance of couch commerce and how it can impact your business!